I am partly saddened and relieved to be missing SXSW in Austin this week. While I enjoy going into the belly of the best and immersing myself in seas of people and technology, it is nice to escape the chaos and check it out via my social media feed. While Marvel and other comic book publishers seem to be moving away from SXSW this year, I am happy to report that the tabletop gaming scene continues to grow. 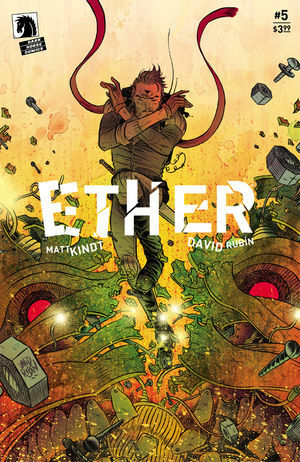 Ether #5 - Matt Kindt and David Rubin delivered a stunning conclusion to the first arc of Ether this week and I am chomping at the bits for volume two. In the final issue of this arc, we learn that Ubel is attempting to open up the connection between the Earth and Ether for his own sinister means. The arc of this series is something to behold. What started with a straggler who appeared to be entering the Ether in the same way one would use a hallucinogen, has evolved into a story of a man who fell victim to what he thought was his purpose in life. We meet his wife in this issue, and learn of her sacrifice dealing with her husband and his obsession with the Ether. I felt a real emotional connection to Boone and Hazel in this issue and really appreciate how much this series has grown in five short issues. Batman: Rebirth #19 - "I am Bane" part four doesn't pull any punches. The juiced up super villain is not too pleased with how Batman and others are working against him. Batman isn't too keen on enlisting the help of Two-Face, Hush, Solomon Grundy, and others, but is still recovering from the viscous beat down he suffered in the last issue. If this first issue is setting the tone for things to come, then there will be a stack of bodies in the wake of Bane as he goes after the Batman. While this series has been steadily improving as Tom King finds his voice writing the Batman, but I wonder if I should switch to All-Star Batman and hop back on the Scott Snyder bandwagon. Daredevil #18 - It appears that The Purple Children helped Daredevil reestablish his secret identity after the cat was out in the bag. The Purple Children, of which their are five of, are the spawn of Zebediah Killgrave, a purple man who has the power to make people do whatever he wants. Killgrave was working on some sort of device that harnessed the power of his children, and had sent a mob to collect the final two. These two ended up on Daredevil's doorstep, and the man with no fear was able to save them and now is attempting to stop Killgrave from completing his device and save the other three children. It remains to be seen if Daredevil has the will to withstand the abilities of someone as powerful as Killgrave. 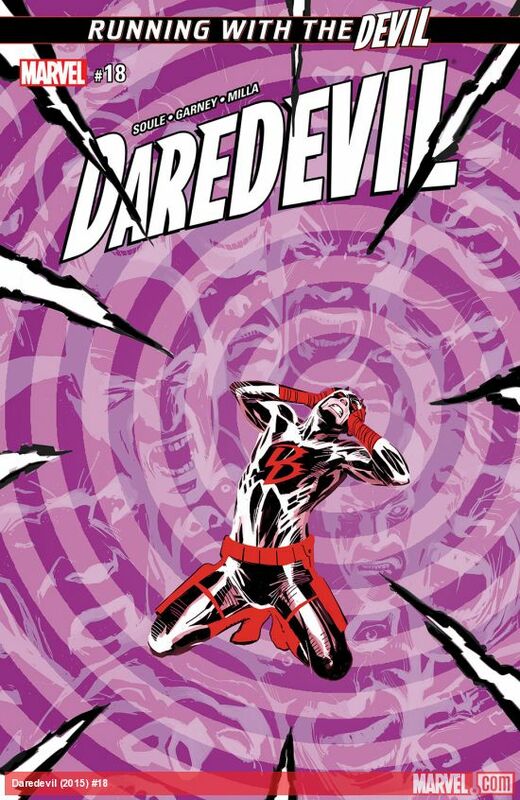 Charles Soule's run with Daredevil is rapidly becoming one of my favorite runs of all time.